Becoming a fee-only financial planner opens up a whole new world of possibilities, but that doesn't mean the transition is easy. Change is hard, especially when it involves something as monumental as your career. Luckily, hundreds of financial planners before you have already successfully navigated the transition. 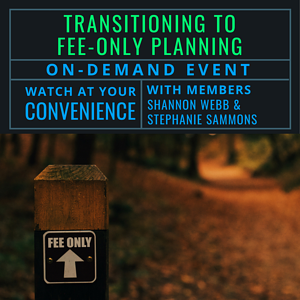 Watch two of those planners, Stephanie Sammons and Shannon Webb, as they share how they successfully made the shift to fee-only planning and provide insight into how you can do the same. This recorded webinar is ideal for anyone considering becoming a fee-only financial planner and joining our community of like-minded advisors. What was your experience working at a Broker Dealer? Why did you decide to become fee-only? What was the conversation like with your previous employer? How did your clients respond to the transition? Did your clients while you were not-fee-only understand the difference? How is client prospecting different in a BD vs RIA? What Do Financial Planners and Personal Trainers Have in Common? Stephanie Sammons, CFP®, is the founder of Sammons Wealth Management and has more than 20 years of financial planning experience. Her specialty is working with forward-thinking women professionals and LGBTQ women who are in their prime earning years. She guides her clients through a comprehensive planning process designed to help them clarify their retirement goals and move toward their ideal retirement lifestyle. Shannon Webb, CRPC®, has been helping families in the Orange County, California area with their financial planning and banking for over 14 years. In the past Shannon, has worked for Wells Fargo, Merrill Lynch and FSC Securities Corporation, an independent broker-dealer. Shannon recently launched his own RIA (Webb Financial Group) in January of 2018 and transitioned 30 million in AUM from the broker-dealer channel in the last 5 months. His marketing efforts are based on his niche as a SmartVestor Pro for The Dave Ramsey Show. His goal is to advise and educate clients and their families about their overall financial picture, including retirement planning, investments, and college savings.